Aaloo Ka Bharta or seasoned, mashed potato Indian-style has its home in the state of Bihar in North India. Serve it with hot chapatis (Indian flatbread) topped with ghee. 1 Peel the Potato and mash them coarsely. Add all the other ingredients and mix well. 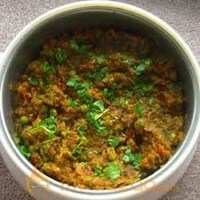 2 Serve aloo bharta with baati.